Cleaners at Goldsmiths will now be made university staff. However some have already lost their jobs. Cleaners at a second London university are celebrating news they will be brought in-house after a month-long campaign at Goldsmiths. The university confirmed it would make 100 cleaners university staff last week, following a campaign led by outsourced workers employed through “facility services provider” ISS, and supported by staff, students and trade union Unison. The campaign was launched when ISS attempted to shorten hours and change shift patterns. At least 20 cleaners say they have been unable to work for a month as a result and some now face dismissal. ISS is notorious for being an unethical and exploitative employer. In 2009 the company colluded with immigration enforcement and tricked cleaning staff at SOAS, another University of London college, into attending a raid that resulted in deportations and detention of many South American workers, including one who was heavily pregnant. SOAS cleaners were brought in house at the end of August, following an twelve year fight for better pay and conditions. At the time, their victory was hailed as an example to other university cleaners and likely spurred on campaigners at Goldsmith’s, but few expected the second University of London college to concede so quickly. The university said in a statement that its Governing Council had approved the plans but the transition would take six months. “This will ensure that cleaners at Goldsmiths benefit from increased annual leave allowance, access to a better pension provision, and maternity, paternity and adoption leave and pay in line with other Goldsmiths staff. 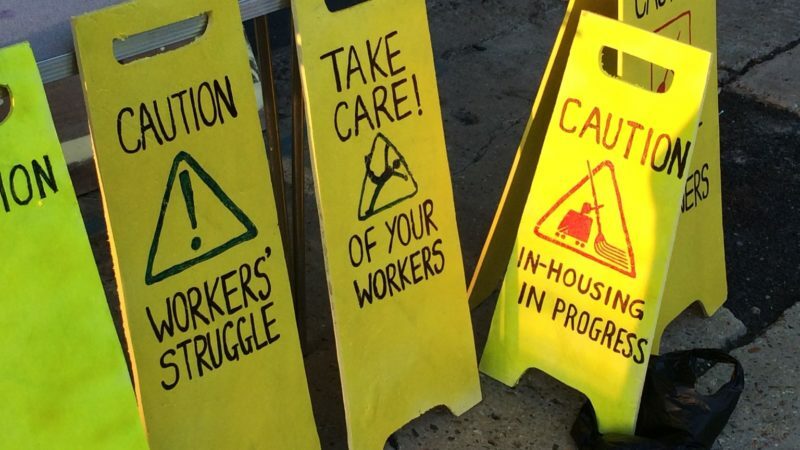 However the Goldsmith’s Justice for Cleaners group has set up a hardship fund to help workers survive the next six months, explaining that while this is a victory, the 20 people who were unable to work for weeks because of the shift pattern restructure have already accrued “crippling financial losses”. The situation is particularly dire for those facing dismissal. We could see a third victory in the coming months, as a campaign to bring cleaners in house at King’s College London is gaining strength. Charlotte England is a freelance journalist. Follow her on Twitter.